During World War II cargo vessels known as Liberty ships ferried supplies to Europe and Asia through hostile waters where enemy submarines hunted for them. Over 2700 Liberty ships were built during the war. Only one of these ships was named for a living person, the SS Francis J. O’Gara. Who was Francis O’Gara and how did he receive this rare honor? 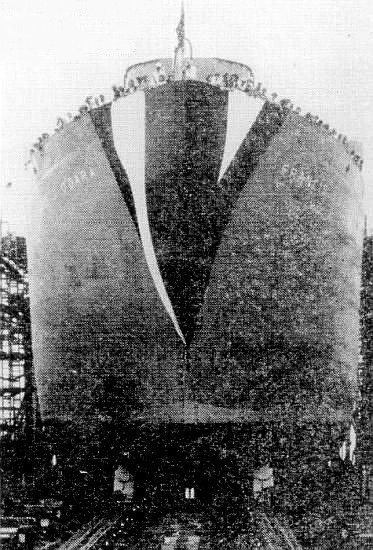 The SS Francis J. O’Gara was launched on June 8, 1945. The O’Gara bore the name of a heroic merchant marine who had been a sports writer for the Philadelphia Inquirer before entering the service. 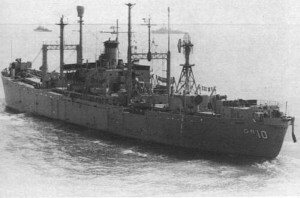 O’Gara was aboard the freighter Jean Nicolet, which was torpedoed by a Japanese submarine in the Indian Ocean on July 4, 1944. The few survivors who were rescued reported the rest of the crew either went down with the ship or were machine gunned by the enemy. When the U.S. Maritime Commission decided to name a Liberty for O’Gara, his sister, Mary, christened the ship with the traditional bottle of champagne as her mother stood by. They would later find out that Francis was still alive! He was one of three survivors of the Jean Nicolet captured and taken aboard the Japanese submarine. The other two prisoners were the ship’s skipper, Captain David Nilsson and radio operator Augustus Tilden. Francis O’Gara was freed Oct. 28, 1945 from a Japanese prisoner-of-war camp. 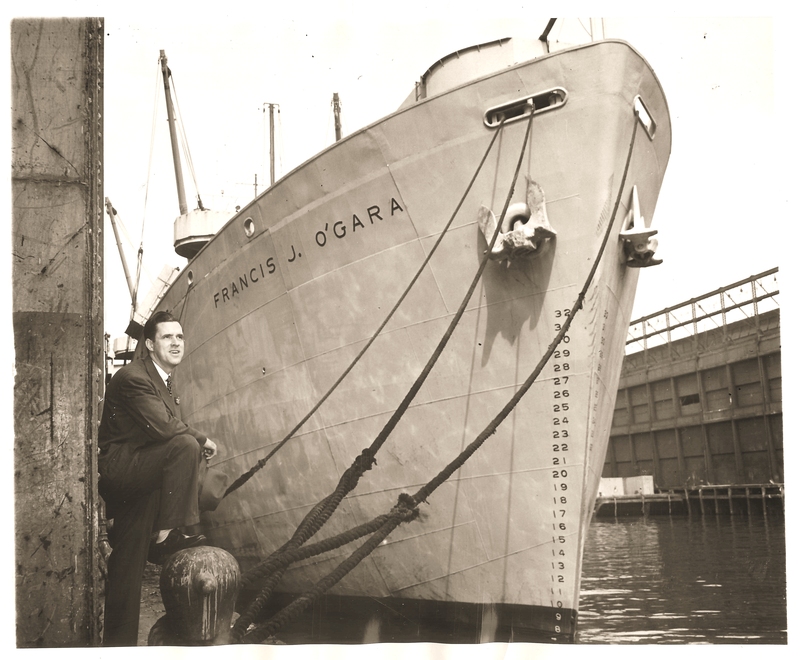 When O’Gara’s ship docked in San Francisco, it pulled in alongside the S.S. O’Gara, making this merchant marine the only living person with a Liberty ship named for him. During the Cold War, the SS Francis J. O’Gara was acquired by the US Navy, converted to a Radar Picket Ship and recommissioned in 1957 as the USS Outpost (AGR-10 and YAGR-10). She was decommissioned in 1965 and sold for scrap in 1971 at Biboa, Spain. Francis J. O’Gara died September 18, 1981, at the age of 69. Francis J O’Gara (6/14/1912-9/18/1981). He was born in Blackstone, Mass. to James O’Gara, of Woonsocket, RI and Margaret McManus of Blackstone. He had a sister, Mary O’Gara. He married a Miss O’Donoghue in 1946 at Philadelphia, PA. They had a least one child named Francis J. O’Gara, Jr. Anyone with additional information on Francis J. O’Gara, please leave a comment. For corrections please contact the author. Is he any relation to my mother, Edna O’Gara (married Frank B. Nuss and lived on Long Island), whose father was John J. O’Gara, a New York City police officer who died ~1949 or ’50? Frank O’Gara was my first cousin. His father, my Uncle Jim, was my mother’s (Winifred O’Gara Mitenius) older brother. Although, in my young memory, they lived in Philadelphia and we in Rhode Island, our families were very close. Frank & Mary, years older my siblings and I, were our favorite cousins. Frank would come up when he was in college and “play” with us. I remember playing Jacks on our l.r. floor. 6-foot Frank would be kneeling down, never could pick up the jacks but would tumble over in the attempt & we’d all laugh. On 4th of July one year he took us to the store & bought $5.00 worth of fireworks (big money in the 30s). Another time he came up with college buddies in an old jalopy & took us for a joyride. He and Mary took us downtown one time, bought us all sorts of stuff. When Grandmother O’Gara died in 1939 they all came up and then took us back to Phila., where Mary took us to all the sights, even Valley Forge. When Frank was missing, Aunt Margaret never lost faith. She wrote beautiful letters to my mother & prayed to St. Anthony, whom she addressed as Tony. We all loved Aunt, Uncle, cousins, agonized over Frank & of course were overjoyed when he was found. Mom went to Phila. as soon as he got home. They came to our weddings, my Dad’s funeral & just were the greatest. My brother Ed & I are Margie (Margaret) Bryce’s godparents, & both Margie and Frank’s son James & his daughter Nancy have come to NH, where I live. ALSO: re Frank’s being the only living person with a ship named for him: that made Believe it or Not by Ripley, along with a bust sketch of Frank. Thank you for you wonderful info & picture! Hello. Does anyone have any information on a Gerard O’Gara (Ron) he has a brother called John. Their parents were John O’Gara and Francis Leigh they lived in Liverpool.